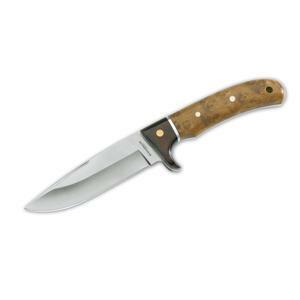 Boker Magnum Elk Hunter Fixed Blade Knife. A functional and stylish hunting knife with a 440 stainless steel blade and rosewood/root wood combination handle. Includes a dark brown leather sheath. This knife is an absolute bargain. You dont expect too much at this price point but this is superb. If youre thinking about it just buy it. Its a well made well finished knife that will more than repay your investment in it for many years. Unbelievable quality for the price. This is a great multipurpose knife well balanced and sharp out of the box. This is a super little knife you could easily pay a lot more for a knife like this. Excellent value for money. Cannot fault it. Beautiful knife for the money nice design balance in hand and sharp. Good value. Excellent value for money highly recommended. I can't believe how good this knife is for the money.&nbsp;I wanted a traditional looking knife for field archery, and I am very happy. It's the perfect size and appearance and the sheath is a snug and secure fit with a wide belt loop. First time Uttings customer and the fast reliable service means I will certainly buy again in future. You can't go wrong at this price. Thank you. Amazing value for money. I collect knives and this has to be one of my favourites. On the Boker website this is over &euro;40...as it should be.&nbsp;Don't bother looking elsewhere - just get this knife! You won't regret it!!! This knife has a decent edge which is perfectly suited to bushcrafting and skinning. It holds an edge extremely well and looks just lovely. The finger guard - excellent. The shape of the blade with the swedge looks fantastic. The sheath is functional, real leather, and has a positive snap button. Delivery by Uttings was super quick. Next day delivery. Great knife. Great price!